I have always loved the photos people capture at night. There is something about the light and how it cuts through the darkness that just captivates me. Plus, the clutter of city life can be hidden by the darkness, which is very appealing to me. 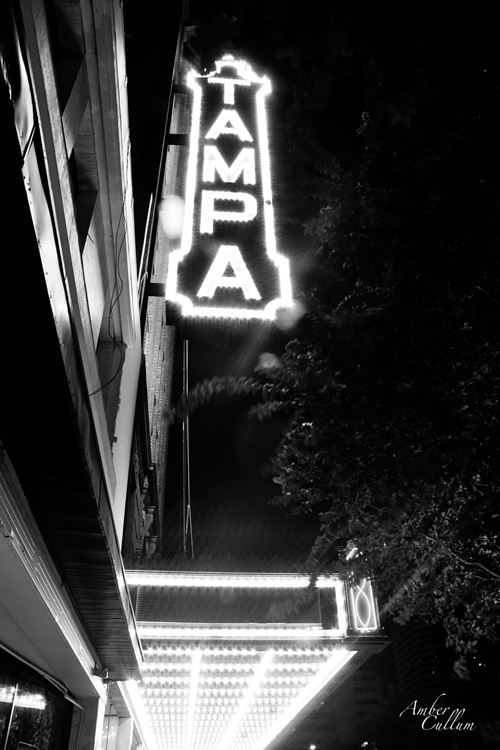 Several weeks ago, my husband and I were able to venture downtown for my first attempt at capturing a little of Tampa at night. I emailed Courtney and asked her to send me the post she shared regarding Slow Shutter Speed to Show Off Movement, which I used to help me capture the photos below. 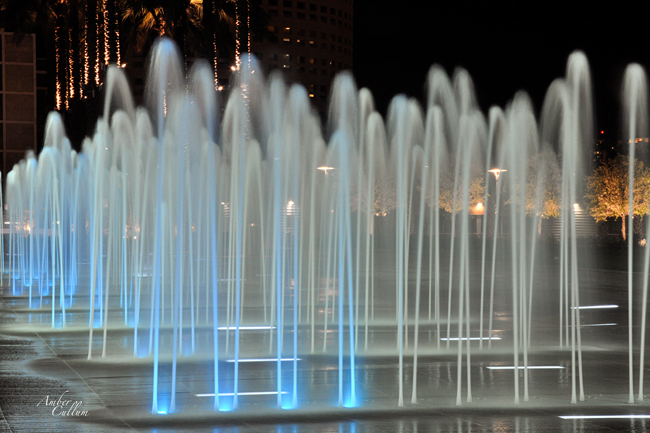 This was taken at Curtis Hixon park which is located in downtown Tampa. It is a fairly new park that is has a wonderful open grassy area, a playground, river walk, and the fountains. 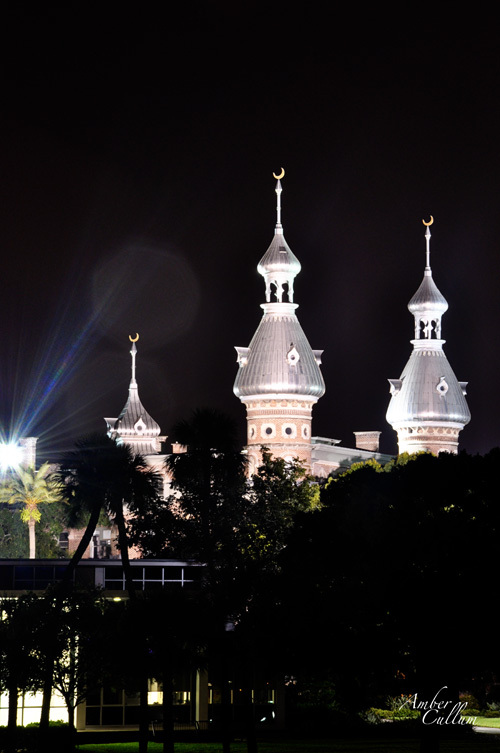 It is adjacent to Tampa's Children's Museum. 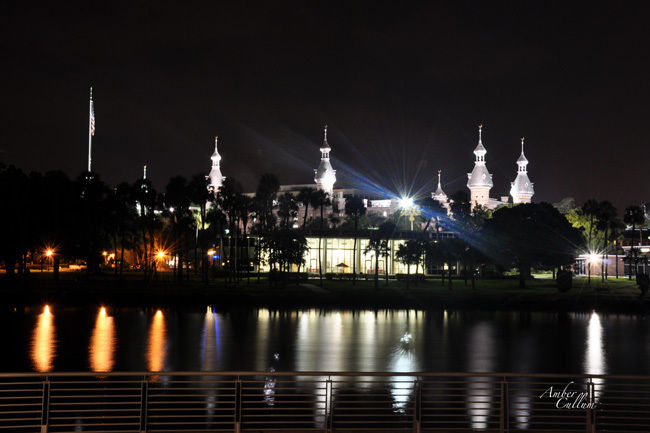 Across from Curtis Hixon park is the University of Tampa. UT is filled with beautiful architecture as you can see. I shared the above SOOC shot on the Good to Wow flickr group Monday, so you may be wondering what I did for the edit. I cropped is slightly and ran Pioneer Woman's Boost Color action primarly to add more contrast. 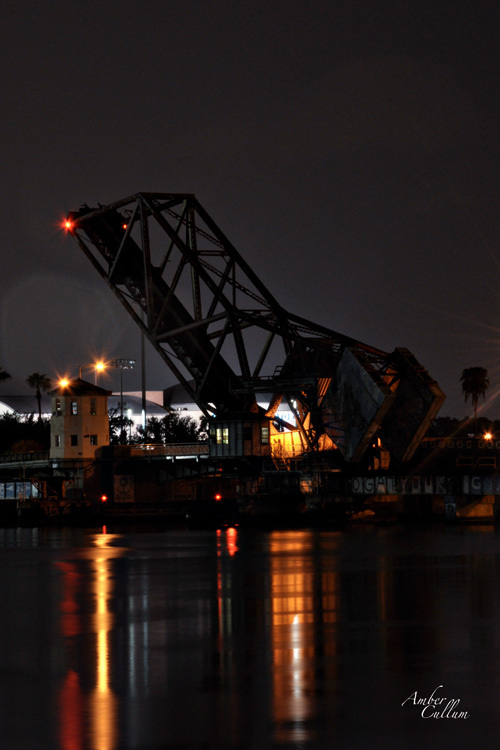 While walking along the river you can view this bridge that is now more of a landmark for those of us who call Tampa home. I shared this photo a few weeks ago during my "If There Were No Heaven or Hell would you still be a Christian?" series. However, I rarely take abstract photos, so I wanted to share it again. 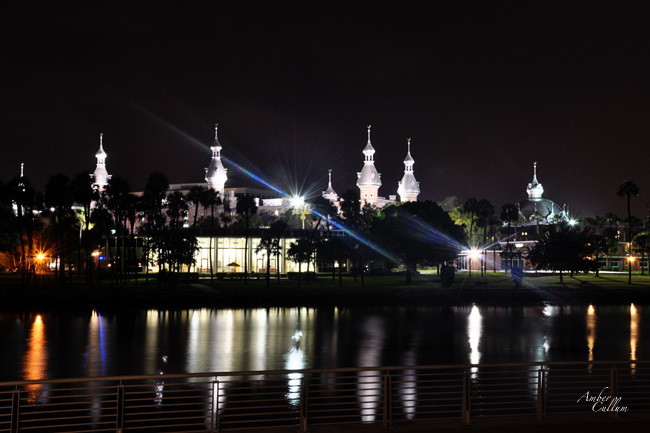 Tampa has a lot of fun things to do. You should come visit sometime. Let me know and maybe I can show you around the city. My next night time venture will hopefully include Ybor City (a little nervous to go there at night) and a shot of the skyline. Linking up with Click It Up a Notch, Shoot and Edit, and Show Off Your Shot. 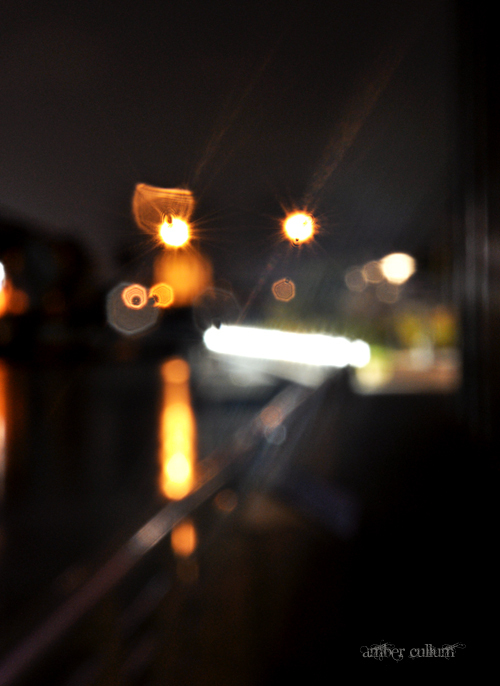 You totally nailed it - I need to spend more time with night photography. I just need a buddy and my tripod. Wow, I love them all, but my favorite has got to be that first photo! It's amazing! Visiting from "I learned". WOW, those reflections off the water at night are gorgeous! Great job. I love all these shots! The fountains look especially cool. These are really neat. i particularly like the fountains. Good work! Oh wow!! Awesome. I love these. WOW- that is all that comes to mind- just WOW a million times! Uh, yeah!! These rock!! You have some awesome night shots! Even your abstract one is pretty cool! I loved your s&e submission sooc and the edit is perfect! Every one of these is spectacular! Light and dark, creamy water, crisp detail, light flares...AWESOME! 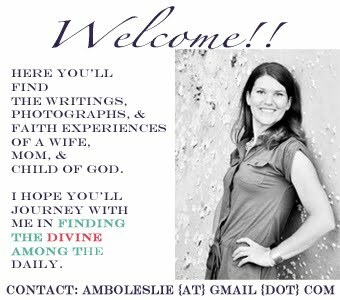 super fantastic shots, Amber! impressive learning . . . and inspiring work. just WOW. Cool! I love nighttime photos when they pop like that. Love the fountain shot, and I remember the abstract one and am glad you posted it again! It is awesome!